Tweet Gabriel Iglesias is one of the biggest comedians, both literally and figuratively, working today. 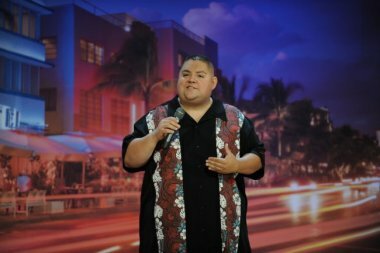 The self- proclaimed fluffy comedian has seen his act go from stand-up stages to Comedy Central, where he hosts his own show called, "Stand-up Revolution." The second season of the stand-up oriented show premieres Thursday, Oct. 4, on the network. Your Comedy Central show "Stand-up Revolution" is going into its second season. What can fans expect this season that may not have been prevalent in Season 1? Season 2 has a lot more surprises on it. First of all, I have comics from all over the world; I've got comics from Haiti, South Africa, from England, and from Canada. There's a good mixture; it's a very diverse show. Also, we're incorporating cartoons into the show. There's a segment where I show a cartoon every episode. They're based on my childhood; it's like an extreme childhood with a little edge to it. On every episode there's a show called, "Hey, it's Fluffy." You do a lot of new material at the beginning of each show. Is this material the same as what you do on the road, or do you write specific for television? Some of the material I stopped doing after I taped it, but there's still some material I'm still doing. As soon as it comes out on TV is usually when I stop doing it because I don't want people knowing what I'm going to say. How is the studio audience different than the audience that comes out to see you on tour or on your show? I wanted to make it where it didn't feel like a shoot, so the difference between a studio audience and the audience I had is I had a paid audience. Everybody paid to come see the show. Everybody was a comedy fan, and they knew about me and knew about Season 1 already. That was half the battle versus having fans waiting outside on the street, having them come check this out, clap when we need you to clap, and laugh when we need you to laugh. I just found out that you were on "All That" on Nickelodeon? When she didn't have a license, you mean? Do you have any thoughts on doing your own sitcom? No. I love doing stand-up; I love being on the road. I love hanging out with my friends. Most people want a sitcom so people can know who they are so when they go on the road, they can sell tickets. That's the goal. I'm at that stage now. You're currently on tour and will be doing some dates internationally. Do you find or are you afraid that certain jokes won't translate well? How do you make sure that material translates well? I make sure my material is very, very broad. I do my research before I go. If I make reference to a restaurant or some type of product, I have to make sure they have that there. People in Europe are very, very hip to what's going on in the world. I notice that you're pretty active on Facebook and Twitter. With the show, the tour, and social media, when do you find time to have a life? (Laughs) Monday, Tuesday, Wednesday, no, I fly home every weekend to see my family. You mentioned social networks, I'm addicted to it. I'm on social networks about four hours a day. Let's go with that.